With a renaissance taking over coffee shops and kitchen counters, there is no reason for you to still be making coffee you're not enjoying with your plug-in brewer. Sure, it’s easy, but chances are the coffee that your old machine produces isn’t the best tasting. In fact, your drip brewer is ruining your cup. Why? Your drip brewer doesn’t know your beans as well as you do. The history of the drip brewer goes back to the 1950’s. Alongside the invention and popularity of other electronic household appliances the plug-in brewer became a popular item that cut the wait time for percolator coffee. The percolator produced over-brewed bitter coffee. The jump from percolator coffee to the electronic drip brewer became a giant leap for mankind. It improved both convenience and taste, but it didn’t highlight specific flavors that discerning drinkers crave in their cup. Real talk: If you brew Folgers coffee and you love it the way it is, keep your drip brewer. If you find yourself consistently let down by the joe coming out of your kitchen, consider upgrading to a pour over. The drip brewer doesn’t know the beans you are brewing. It’s programmed to operate the same way each time, by pouring scalding hot water (one of the basic variables) over a bed of coffee that doesn’t brew evenly. Take Control Over Your Coffee: Get a Pour Over. 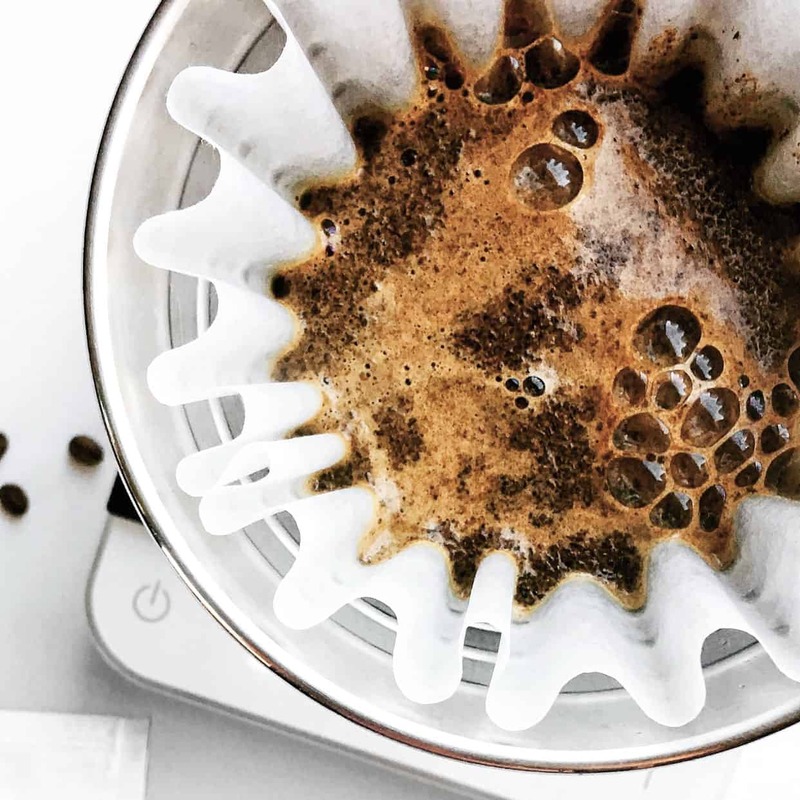 One of the most popular and trendier ways of making coffee right now is the pour over. It’s a brewing method available in most coffee shops where the barista manually pours the water from a kettle over the coffee and drips through the filter and down to a cup. They probably charge you $4 for it too! So why pay more for a slower cup of coffee versus getting a cheaper drip coffee? First, it tastes better. Fine coffee has a lot of nuance to its flavor. That's why you've probably noticed Starbucks tastes different from the fancy shop on the corner and that tastes different from the fancy cafe on the opposite corner. It's not just the roasting process – there are a lot of variables that effect how a specific bean will brew like grind size, water temperature, and brew time. A pour over is about as manual as you can get when it comes to controlling all of these important factors. Using a regular old countertop automated coffee machine is the microwaved pulled pork to a pork roast you cooked slowly and intentionally in your smoker. Second, having control over how you brew your coffee is truly satisfying. A machine compromises the skill involved in brewing a better tasting cup of coffee for the sake of convenience. In our previous post on Brew Basics we introduced you to the proper use of the four fundamentals of brewing coffee. So now you have yourself a scale, a quality grinder, good filtered water, and some fresh whole bean coffee. Now let’s brew it, pour over style! Ironically, I called your Mr.Coffee machine historic as I’m trying to promote the pour over. It turns out the pour over has been around since the early 1900’s, way before any automated kitchen appliance. The method has evolved to many different designs. Choosing the right one for you might become overwhelming, especially if you aren’t familiar with each type of pour over. 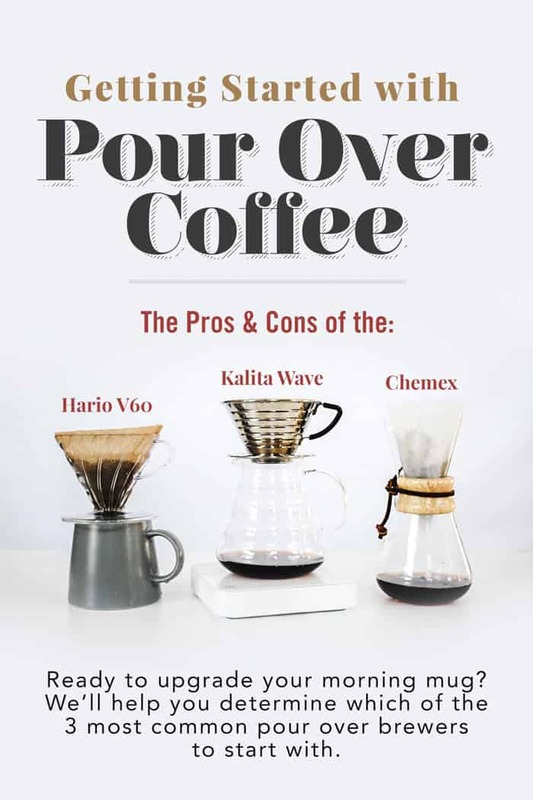 With all the pour overs out in the market I’m going to review what are widely considered the top 3 pour overs within the coffee industry: The Hario V60, Kalita, and the Chemex. All three are designed differently and require their own specific filter, causing a difference in extraction and therefore producing unique flavor profiles. This one might just be the most iconic pour over out there. The V60 is made by Hario, a famous Japanese company that makes heat-resistant glassware. The company has built a reputation for quality products since 1921. This popular pour over device requires a careful technique, a timer, and gooseneck kettle but rewards you with a delicious tasting cup of coffee. If done correctly, specific flavors can be brought out depending on the type of coffee brewed. 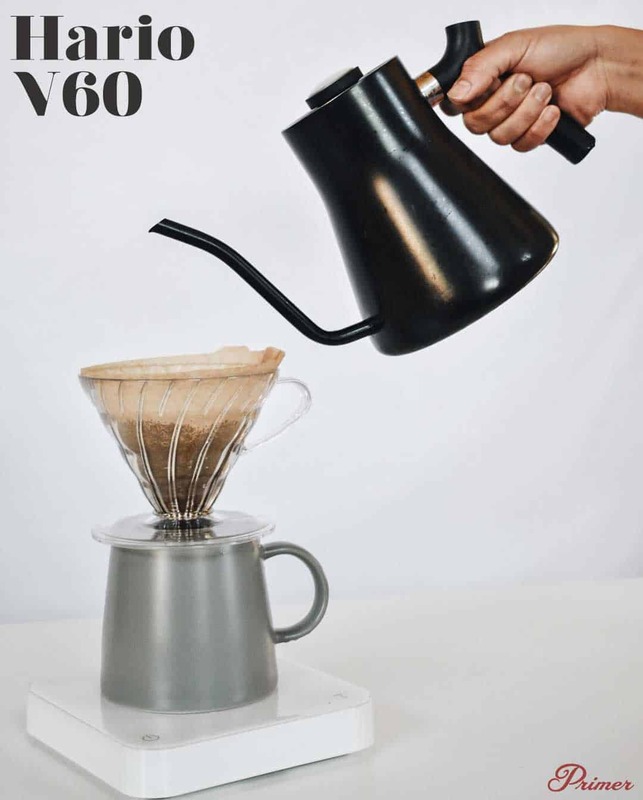 Click here for a step-by-step on how to brew with the V60. Conical design of this device gives you a more pronounced floral and fruity cup. Shape of the filter allows the coffee to extract to a center point, helping develop a clean and bright cup of coffee (opposite of what a French press would give you). Affordable. Starting price is at $20! Check out this full kit on Amazon for only $20! Meticulous consistency is required when brewing. V60 filters are not readily available in grocery stores. Must be bought online. People who are patient and exacting. Those who enjoy the coffee-making process and are willing to invest time in experimenting. If you want a good cup of coffee but don’t want the sophistication the V60 might carry, then the Kalita Wave is the right one for you. Similar to Hario, Kalita is another known Japanese brand that is famous for their line of coffee equipment. 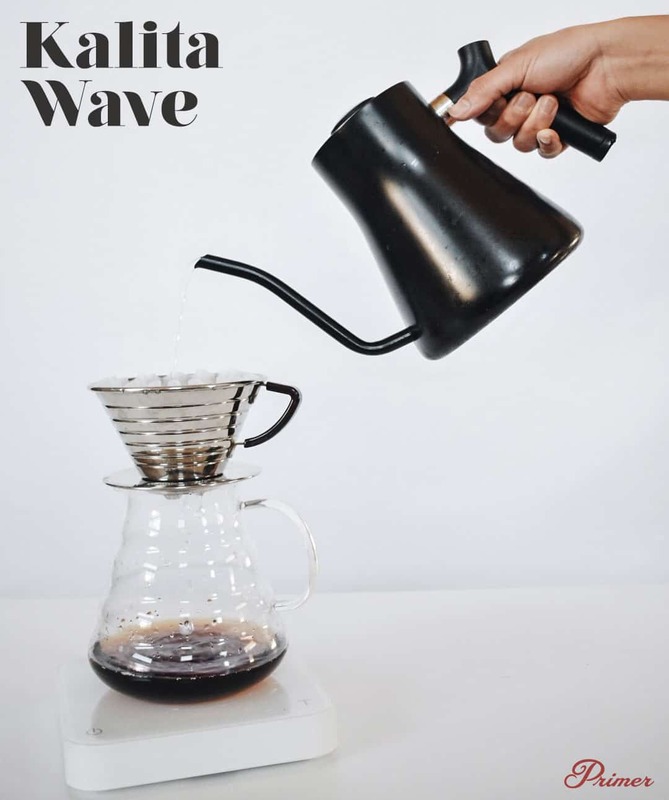 The Kalita Wave was invented in response to the market’s demand for an easy to use, hassle free dripper that didn’t involve the specific skills needed for a conical pour over dripper. This simple to use pour over requires a scale, and a gooseneck kettle. Click here for a step-by-step on how to brew with the Kalita. The flat bottom design of this dripper allows an even extraction for a consistent cup. Not sensitive to inaccurate water pouring. Minimal pouring skill required. Affordable! Usually priced under $30. This one on Amazon is on sale for $24.99. Filters not readily available in grocery stores. Must be purchased online. Although it’s an easy-to-use dripper, some flavors tend to be “muted” in this brew process. Floral and fruity flavors tend to be compromised in return for the consistency of the brew. People who want to keep the same routine every morning. Those who don’t want all the complications of timing their pour. One of the most iconic ways of making pour over coffee is the Chemex. It was invented in the 1940’s by an American chemist named Peter Schlumbohm. It was during a time when a majority of American households drank burnt percolator coffee. 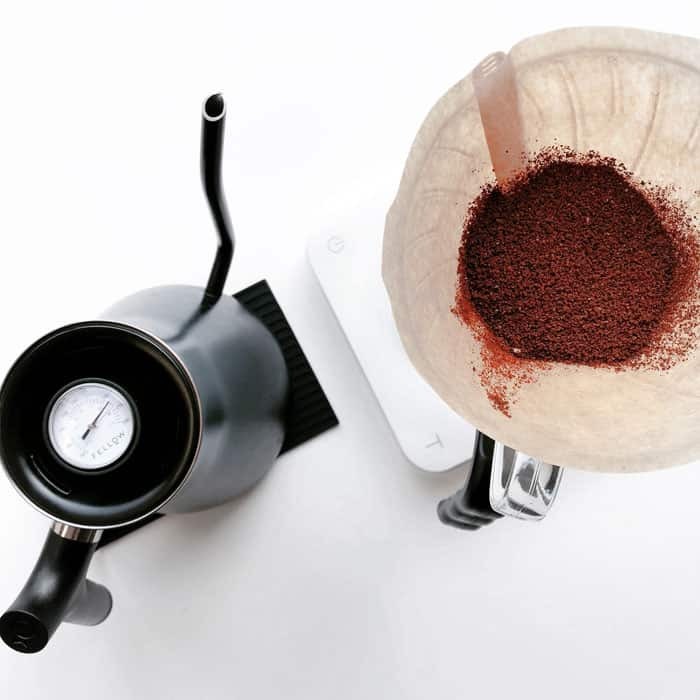 Schlumbohm wanted to create a simple brewing method that didn’t require any extra accessories. With the Chemex, you have your serving carafe and cone dripper all in one piece. A favorite by both young baristas and baby boomers, this iconic kitchen appliance has made its name across all ages. 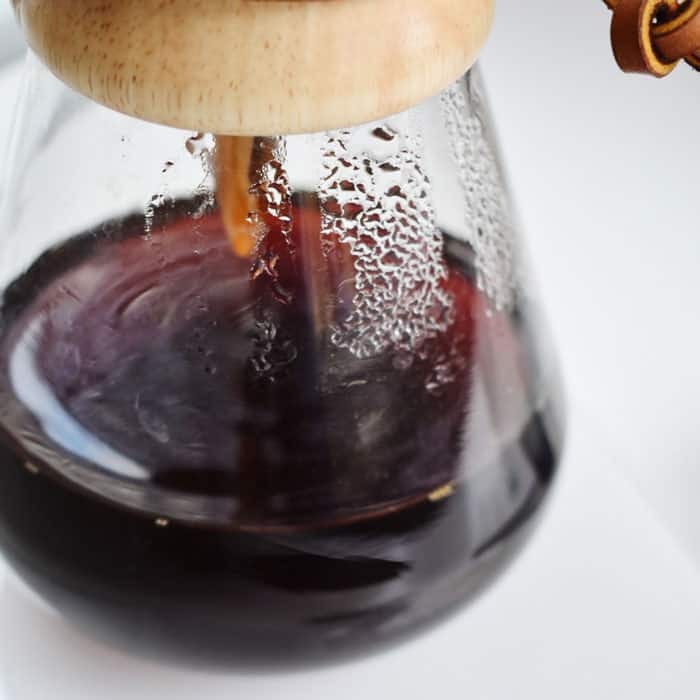 This pour over is unique among all others due to its thick filter that absorbs and filters majority of the oils, leaving you with one of the cleanest-tasting cups of coffee. Sidenote: Aside from great tasting coffee it produces, this aesthetically looking device also acts for a great display piece in the kitchen. It's one numerous design awards and is on permanent display at the Museum of Modern Art in New York City, among others. Material: Glass. Available with the classic wooden neck or glass handle. 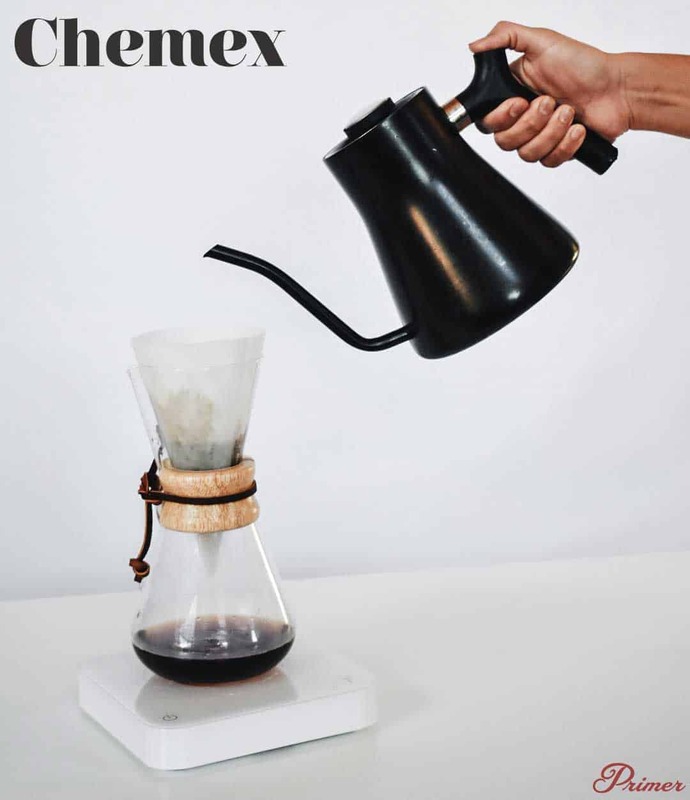 Click here for a step-by-step on how to brew with the Chemex. Carafe included in the design. Great for making & serving multiple cups. Chemex filters are becoming more easily found in most grocery stores. Due to its thick filter, the flow of water is slowed down significantly. So ff you’re a tea fan, you can use it to technically steep loose leaf tea. Dual purpose! Affordable ranging in price from $35-$50 depending in capacity size. Check this one out on Amazon, on sale for $36. The unique Chemex filter gets picky with the type of beans used. This brew method usually prefers lighter roast, fruity beans. Narrows your variety of coffee to brew. Due to its conical drip design, specific pouring techniques are required to achieve the perfect cup. People who love to entertain or drink more than one cup at a time. 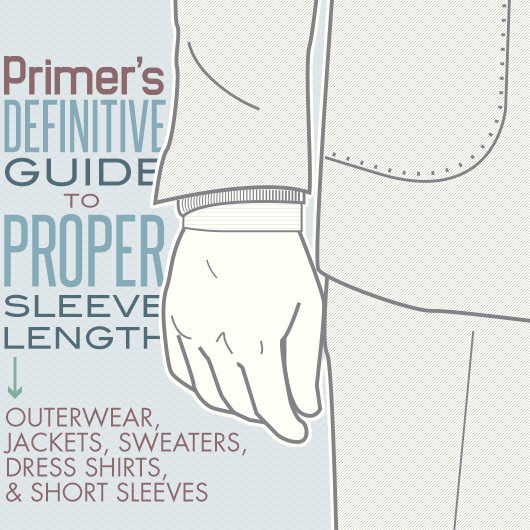 Those who like the versatility of aesthetic and purpose. I’ve been working in the coffee industry for over five years now and I went through phases with my ‘coffee personality’. Initially I wanted something that looked cool – I first got a Chemex, and I was amazed with the bright flavors it highlighted. Later on I became more precise and adventurous with my brewing and acquired a V60. Now, at home in the morning, my palate wants consistency in flavor so I brew the same one or two favorite coffees over the Kalita. After brewing thousands of cups of coffee at home I’ve settled with the Kalita which suits my lifestyle and palate. Occasionally on the weekends or when I get a new bag of coffee I’ll experiment with the V60 or the Chemex. In all honesty, you can never really go wrong with any of these three pour over drippers. Choosing the right one for you all winds down to your own personality and preferred flavor profile. Are you an entertainer? 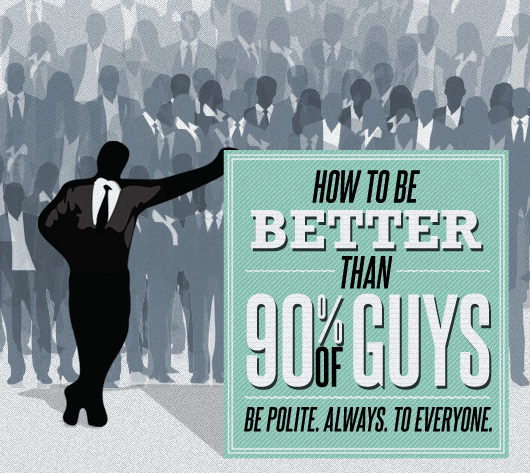 Are you the meticulous type? Are you adventurous with your coffee? Or are you just the type of person who just wants a consistent pour over ritual every morning? Coffee is always changing and people’s palates are always changing as well. I can’t give you a clear answer on which pour over is the winner. Many people will argue different pour over devices as the best. I listed these three pour overs because these three are considered to be the most popular, reliable, and affordable in the industry. If you don’t want to buy all three at the same time or are in a real tight budget, go to your local coffee shop that brews using pour overs and pick a type of coffee that you originally like and ask for an opinion on which pour over method it’s brewed best over. Have you tried pour over coffee? Which one is your favorite? Let us know in the comments below! I use the Hario, but I have found that the standard cone filters for $2 a hundred work just fine, you don’t have to use the V60 filter. Just form them down in the funnel, add coffee and they work just like the Harios. When I want the Hario filters, I watch for on-line sales at William-Sonoma, get them for 20% off and free shipping. I’ve been doing French press for a while now. I like it because I can set it and continue getting ready while it brews. It, along with my capresso burr grinder and temp settings electric kettle were a huge upgrade from pre-ground drip coffee. That being said, I will be the first to admit it doesn’t make the cleanest coffee. I’ve thought about getting a pourover machine and I think the chemex is for me because of the ability to make multiple cups for myself and my girlfriend. Been using the same ceramic Melitta drip cone for over 10 years. Both the cones and the filters are dirt cheap and I think it brews a great cup!